Leeward Bay Tarpon Bay Condos: Come enjoy this coastal inspired detached villa floor plan this season! Tarpon Bay is located in one of the best premium sites in Naples. A single family lifestyle offering 2 bedroom + a den/study, 2 bathrooms & 2-car garage. This stunning home sits on one of the finest lots in Tarpon Bay. Take a dip this season in the heated pool & enjoy time on the screened in lanai while the weather is absolutely perfect! The interior features tile throughout w/ carpet in the bedrooms, & wood flooring in the den. Kitchen boast corian countertops, gas cooking, plenty of cabinet space & eat-in breakfast area. The dining room & leisure room have a coastal look with pops of aqua throughout the home making it feel like you've just stepped off the beach! Community amenities includes a clubhouse, fitness center, an infinity edge swimming pool & spa, tennis, basketball, putting green & professional management onsite taking care of your every need! 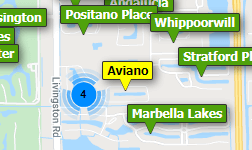 Just minutes to the Gulf of Mexico white sandy beaches, Mercato, Waterside Shops & Olde Naples. It's a beautiful lifestyle! Cayman Tarpon Bay Condos: Live the Florida Lifestyle you have been dreaming of! Enjoy one of THE BEST LAKE VIEWS in the neighborhood. Residents love this "secret location", nestled in a quiet residential area with easy access to Vanderbilt Beach Rd and convenient access to I-75. Carefully selected and lovingly cared for by original owners, this villa home features 10'+ ceilings (tray ceiling in Master), coupled with a level of privacy that you will appreciate. FRESHLY PAINTED, tile flooring throughout the main living area, and NEW CARPET in bedrooms & den/office, it's ready to welcome new owners. Tarpon Bay is a NATURAL GAS COMMUNITY featuring Lush Preserve Areas/nature trail, three lakes and the Castaways Club with state-of-the-art fitness center and billiards room, infinity resort-style pool, tennis, volleyball, basketball, putting green and children's play area. In addition to the great amenities, association fees include: Gated entry, basic cable, building insurance & maintenance (including roof), irrigation water and lawn/land maintenance. A/C replaced in 2015. With FULL HURRICANE PROTECTION for peace of mind, this is one of those special homes in a great community that you will be so glad you found! Cayman Tarpon Bay Condos: NEW A/C * PRICE REDUCED * Former MODEL HOME with POOL For Sale * MOST DESIRABLE SW Exposure; Long Lake Views & great light makes this a must see. PRICED to SELL; Offered TURNKEY; this highly desired Admiral floor plan has one of the best locations in this North Naples Community. Kitchen has 42-inch cabinets, solar tube, Natural Gas For Cooking. 16-inch tile throughout all living areas. Plantation Shutters & custom sliding vertical shades with recent upgrades to include NEW AC in 2019, tankless hot water heater & pool heater. The master suite is a tranquil retreat on its own with fantastic lake, garden & pool views. Short Walk to Tarpon Bay's amenities center; Castaway Club, a resort style feeling with an infinity resort style pool overlooking a 15-acre lake. Spa, barbecue grills, state of the art fitness center, fishing pier, butterfly garden, clay tennis, clubhouse, business center, card room, billiards, fishing pier & nature trail completes the vacation feel. Walking distance to shops & restaurants. Easy access to I-75 or to the Beach / Gulf in minutes. A sense of elegance greets you as you enter the gated community with mature landscaping, tropical foliage & fountain. Bimini Bay Tarpon Bay Condos: Bimini Bay Condo in Tarpon Bay offers Southern Exposure, premium upgrades and 3 bedrooms, den, 2 bathrooms, nook, 2 car garage plus additional parking. The kitchen has new stainless steel appliances, backsplash, under and upper cabinet lighting, exotic granite counter tops, new double sink, faucet, pantry & elevated bar. This home is spacious, has volume ceilings, Walk-In closets in each bedroom and a laundry room with cabinets. Also included are impact resistant windows, crown molding throughout, a newer AC, walk-in shower with seat in owner's bathroom, porcelain tile on the diagonal, Bamboo flooring in the den, artistic faux painting & sophisticated fans & lighting accent this condo perfectly. The garage has shelvings and an attic access door with integrated ladder. Enjoy tranquil and private natural preserve views from your spacious wrap-around Lanai. Tarpon Bay is a resort style community offering an infinity pool, spa, BBQ grills, fitness center, fishing pier, pickleball, tennis, business center, billiards, catering kitchen and social activities. Conveniently located in North Naples, close to white sandy beaches, restaurants, shops, grocery stores & SW International Airport. Bimini Bay Tarpon Bay Condos: Only a few Lakefront Bimini Bay condos were built in Tarpon Bay and they are rarely available, don't miss this opportunity! This first floor end unit condo is also just a short walk to the amenity center and offers lots of green spaces in the backyard and extra long driveway with guest parking! The Condo offers 3 bedrooms, 2 bathrooms, 2 car garage, and a spacious wrap-around Lanai. This impressive condo includes upgrades such as the kitchen appliances, wood shelves in pantry, level 5 granite counter tops, updated washer and dryer, a newer AC and a Tankless Hot water heater, window coverings, Built-Ins in Owner's Suite Closet and the guest bathroom has been updated with a frameless glass shower door. This condo offers an open floor plan with an abundance of luminosity, making this condo bright and cheerful. Tarpon Bay is also an all natural gas community and a resort style community offering an infinity pool, spa, BBQ grills, fitness center, fishing pier, tennis, business center, card, billiards rooms, catering kitchen and social activities. Conveniently located in North Naples, close to white sandy beaches, restaurants, shops, grocery stores & SW International Airport. Call Today! Leeward Bay Tarpon Bay Condos: Great access to all of Southwest Florida and a great location within the community gives this free-standing home a special value. Private preserve views in the rear and on the side gives this villa the feeling of living in the country. Condo ownership relieves you of all maintenance,insurance on the structure. Hurricane Irma roof damage is not an issue as the insurance company has already paid the HOA for a totally new roof on this home. While the final negotiations continue for the HOA with the insurance company, the seller will guarantee that they will pay any assessment associated to Hurricane Irma. Many upgrades are included, such as beautiful granite kitchen countertops, stone back-splash and wall accents, tile floors in the main living area and upgraded stainless-steel appliances. A new HVAC and water heater were added in 2017. Tarpon Bay has the very best in club amenities and activities including a large infinity pool, hot-tub, work-out room, separate exercise room, pool table room, card room. computer center, lighted clay tennis courts, child play area. A full time on-site manager, assistant mgr. and maintenance staff make for no worries. Rent to Own an option. Leeward Bay Tarpon Bay Condos: Freshly Painted, Impeccable & Move-In Ready! Stand Alone Villa Home with extended 1,730 sq ft of spacious living space, 2 bedrooms, Den, 2 bathrooms and 2 car garage. The kitchen has updated appliances, quartz counter tops, gas range, pantry, lots of cabinets, breakfast bar and eat-in area. The owner’s bathroom is beautifully remodelled with a large walk-in shower, wood vanity, double sinks, granite counter tops, wood framed mirrors and lights. Updates include tile on the diagonal, wood laminate flooring, NO CARPET, newer washing machine, plantation shutters. Easy living with NO EXTERIOR MAINTENANCE (roof, landscaping, exterior insurance & paint ALL included in the Fees). Hurricane protection includes impact resistant windows & accordion shutters. Enjoy privacy and tranquility from your Lanai overlooking a lush tropical preserve. Tarpon Bay is a resort style community offering an infinity pool, spa, BBQ grills, fitness center, fishing pier, Pickleball, Tennis, business center, card and billiard rooms, catering kitchen & social activities. Conveniently located in North Naples, close to white sandy beaches, restaurants, shops, grocery stores & SW International Airport. Call Today! Bimini Bay Tarpon Bay Condos: MAKE YOUR BEST OFFER HERE FIRST! Sellers have found another home & are ready to SELL!!! Look at this 1st floor corner unit in Tarpon Bay! This unit features 9 foot ceilings, a terrific open floor plan, plantation shutters and diagonal tile. Also included is a surge protector and ultraviolet system for the AC (No mold here)! AC unit is new as well as the stainless steel appliances to include a gas range. There is even a cable hook up outside on the covered wrap around lanai. The master bedroom is very spacious with a beautiful, large master bathroom, 3 closets, and access to your screened lanai. The location is very private without any buildings in your view. Less than a mile to the Tarpon Bay Plaza and 10 minutes to the beach. This unit is also a short walk to The Castaways Club which offers a private resort-style pool, hot tub, fitness center, and Har-Tru tennis courts. With the ability to purchase a private club membership at Tarpon Cove Yacht & Racquet Club, this is a great deal and a must see! Sellers are relocating & are flexible with a short closing date OR a closing in 2019.. Just ask!! Neptune Bay Tarpon Bay Condos: The soul of serenity, this stunning updated 2BD/2BA end unit condo w/den is a true sanctuary w/serene panoramas, tucked away in the gated Tarpon Bay lifestyle community. This sophisticated first-floor condo offers every amenity for the discerning homeowner including attached private garage & two additional parking spaces in a lush, landscaped setting. From the moment you enter, the effortless open flow draws you through one fabulous space after another, highlighting an incredible dine-in kitchen rendered in granite, wood cabinets w/soft close drawers & stainless-steel appliance including gas stove. Breeze through to the screened lanai accessed by the living, dining & master suite as you entertain to the sights & sounds of the tranquil nature preserve. Featuring a spacious walk-in closet plus secondary closet in the master, as well as newer AC & gas instant water heater, this home assures beautiful & easy care living met w/endless world-class HOA amenities including Lakefront Pool & Spa! Neptune Bay Tarpon Bay Condos: Fantastic North Naples location with entry from Immokalee road and Oakes Blvd. 2nd floor unit with new refrigerator December 2018 and new carpet installed August 2018. Very Open 2 bedroom plus den floor plan. Easy stairs to walk up. Very light and unit is in immaculate condition. This unique feature of one car garage attached with a double space driveway is hard to find. Great amenities and a low HOA fee. Currently rented until August 15, 2019. Need professional assistance selling your property at Tarpon Bay Naples? Find out how an Area Specialist can help to generate more property exposure in order to get the most money for your investment in the least amount of time.